Upon arrival in Kilkenny we immediately headed out on foot in the direction of St Canice's Cathedral, clearly visible on its elevated perch in town. This 13th century Anglo Norman Gothic cathedral and 9th century round tower stand on the site of an earlier church founded in the 6th century and named after St Canice. Christian worship has occurred on this site since that first settlement. We were so caught up in photographing the exterior of this beautiful cathedral and round tower we failed to notice the Cathedral closes earlier during the winter period. What a disappointment when we saw someone leave the cathedral and lock up just as we were approaching the doorway. We had missed our chance to enter the cathedral. During the summer months the Cathedral is open to visitors until 6 pm but alas it closes at 4 pm in March. The cathedral is nearly 69 metres long which makes it the second longest Cathedral in Ireland, and its width along the transepts is 37.5 metres. I was enthralled with the architectural details of the Cathedral, including the embattled walls, central tower, two small spires at the west end and the ornately carved heads on the tops of the capitals in the entry vestibule. The Cathedral features a wonderful array of medieval effigial tombs, similar in quality to those at Jerpoint Abbey. Pictured below is an example of one of the many superbly crafted medieval graveslabs in the floor of the Cathedral. 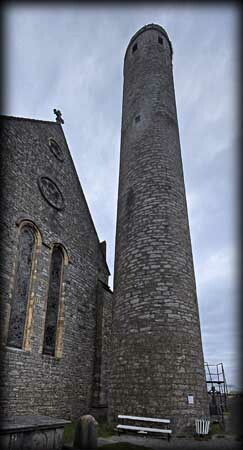 The round tower is the oldest surviving structure in Kilkenny. Like the cathedral, it is built of local limestone, and is 30 metres tall with an external diameter of 4.5 metres. 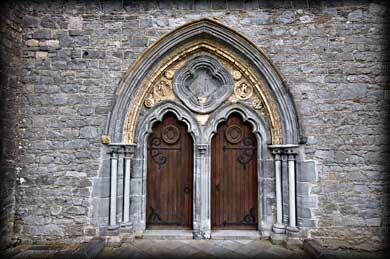 The plain arched doorway is 2.7 metres above ground level. 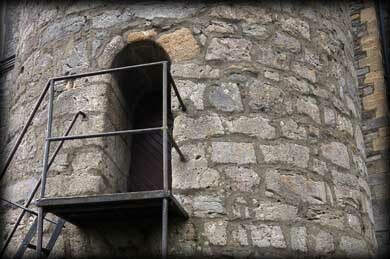 The round tower is one of the few towers in Ireland that can still be climbed to the top via a series of steep internal ladders. The others being Kildare and the one on Devenish Island. 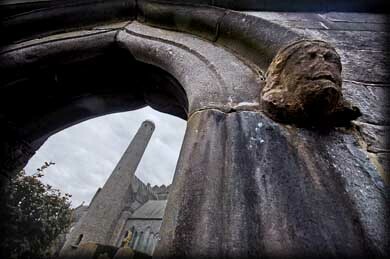 The city of Kilkenny can be viewed from the parapetted top - the traditional conical cap is missing. The top storey has 6 equally spaced windows rather than the usual 4 in each of the cardinal directions - a trait found only on one other round tower in Ireland at Kilmacduagh. 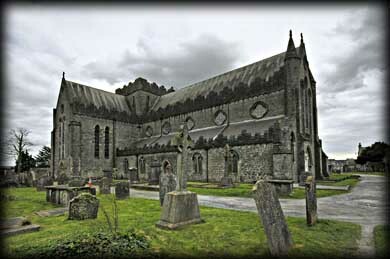 An excavation in 1845 found that the foundation extends less than 1 metre down and also revealed skeletons laid in the Christian tradition of an E-W orientation possibly documenting that the tower was built in the cemetery of the early settlement.We have so many reasons to visit Kilkenny again in the near future, one of them being to photograph the wonderful effigial tombs in the Cathedral and also to climb the stairs to the top of the round tower. 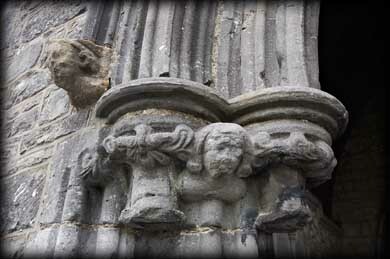 The name Kilkenny is derived from Cill Channigh the Irish for Church of Canice. Situated: Very easy, located in the centre of Kilkenny Town. From the castle head north along High Street onto Parliament Street and Irishtown. The Cathedral is at the end of this Street.